Automated, or robot, warfare is coming to a battlefield near you, and sooner than many people would like. Where the technology leads from there is anyone’s guess. As reported by the UK’s Daily Mail, BAE Systems — a British defense, security, and aerospace firm — has published several images featuring its new driverless mini-tanks that it hopes will revolutionize the way men and women fight. 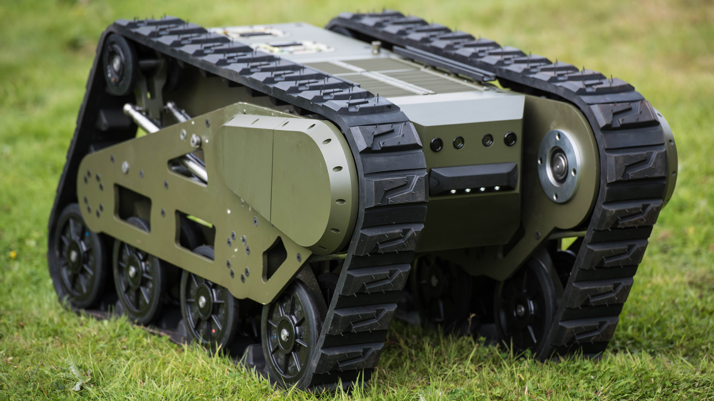 Codenamed “Ironclad,” the concept envisions machines working alongside other machines like unmanned aerial and ground vehicles in support of human forces. What’s more, the Ironclads are versatile; they can be outfitted with several attachments so they can be adapted for use under a variety of conditions and circumstances including bomb disposal, reconnaissance, and evacuating troops from the field. BAE Systems aims to make them completely autonomous in future, meaning they operate without a human controller. They will be equipped with ‘friend or foe’ tracking software to avoid friendly fire and keep soldiers out of harm’s way. Currently, concept models operate via wireless control within a range of up to 1 kilometer (0.6 miles). The company showcased the new vehicles at an upcoming defense trade show, the Defense and Security International Conference, which took place last week. But so far, officials said there is no official deployment date for the Ironclad systems. Robotics have been making their way to the battlefield for years. As far back as 2009, troops in Afghanistan deployed tracked robots that were used to locate, and then help dispose of, roadside bombs and other ordnance. In addition, hand-launched unmanned aerial vehicles (UAVs) have also been used by ground troops for a number of years. As for BAE, the company says its Ironclad platforms are designed to take on “some of the most dangerous jobs that soldiers currently face,” said a statement cited by the Daily Mail. While humans will remain “at the center of decision-making,” the company said, the need to quickly react to a threat may mean that some control of weapons systems will be handed off to artificial intelligence systems powering the mini-tanks. The Ironclad systems have rubberized tracks but armored hulls that protect the mini-tanks from blasts and small-arms fire. And because they run off of a high-powered battery, they are very quiet. They are also rangy; they can travel 31 miles on a single charge, the company said. The small tanks are also modular, in that they can be used in tandem — as in, joined together for evacuation of a wounded soldier. “Artificial intelligence is the future, not only for Russia but for all humankind. It comes with colossal opportunities, but also threats that are difficult to predict. Whoever becomes the leader in this sphere will become the ruler of the world,” he said. “No-one can be entirely sure what the future will look like, but we do know that it’s a relatively short step from the technology available today to having a fleet of autonomous vehicles sharing situational awareness and – where appropriate – making certain decisions independently,” said John Puddy, the technology lead at BAE Systems Land.